DeSoto (TX) High Schools fastest ever 4x100m team (40.09) from the 2012 UIL Texas State Meet. Historically, Texas dominates the 4x100m relay. No other state comes close to having the number of teams on the top 500 all-time list. Texas has 176 teams on the all-time list, with only the program's best marks showing up. On the top 500 all-time list -- which allows each team on the list more than once -- Texas has 308 performances. The next closest state to Texas is Florida with 77 teams, followed by Georgia with 46 and California with 43. Of those performances, DeSoto (TX) High School has the most team performances show up on the top 500 all-time list with 34 races across multiple years. Its best performance in the 4x100 relay as a team was its 40.09 second team record in 2012, which ranks US No. 13 all-time. The guys ran that performance to win the UIL Track and Field Championship. Just down the road from DeSoto is Lancaster High School, which has the second highest number of performances on the top 500 all-time list with 28 races. Plantation American Heritage (FL) High School has 18 performances on the top 500 all-time performer list, which is the most of any team not from the state of Texas. 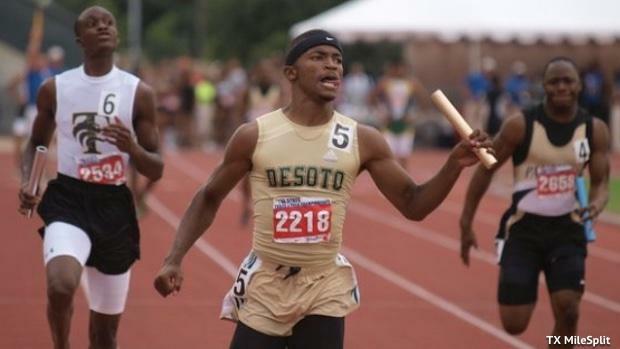 Although DeSoto may have the most performances in the top 500 all-time, Fort Worth Wyatt (TX) holds the national record of 39.76 from May 10, 1998. So far in 2019, there are 15 performances on the top 500 all-time list. The Fort Bend Marshall guys clocked a 40.39 so far this season, which ties as a US No. 45 all-time mark. But it's not the best mark all-time for the team. That distinction goes to the 2016 squad which ran 40.13 for US No. 13 all-time. One more fun fact: The fastest team this year to run its fastest time in school's history is Houston Strake Jesuit. The boys team ran 41.08, which currently ranks US No. 9 and is tied for US No. 193 all-time when teams are only ranked once. Check out the full lists in the links below, along with the current 4x100m national rankings.